Taking a page out of the Bernie Sanders playbook, Governor Andrew Cuomo, with Bernie Sanders standing by his side, proposed free university tuition in New York state for residents making less than $125,000 a year. New York on the east coast and California on the west are taking the lead in preserving and advancing progressive values in the Trump era, which will probably see conservative values extolled at the Federal level. However, Democrats like Chuck Schumer, Elizabeth Warren and others will do all they can to block Republican efforts to shred the safety net for poor and middle Americans. Meanwhile, state and local governments in progressive states will do all they can to advance the cause of values that benefit average Americans. Tennessee and Oregon already have programs to cover the costs of community college. Governor Cuomo’s plan would include four-year schools as well as the city’s university system — a once-free network whose tuition has risen and reputation has fallen over the last decade. It’s unclear how much this program will cost. New York already offers in-state students one of the lowest tuition rates in the nation. Current full-time tuition at four-year State University of New York schools for residents is $6,470; at two-year community colleges, the cost is $4,350. Full-time costs for City University of New York schools are about the same. Cost estimates put the price of the new program at $163 million. There are an estimated 940,000 New York households with college age children who would be eligible for this program. New York state has the nation’s largest public university system with 440,000 students and 64 campuses. 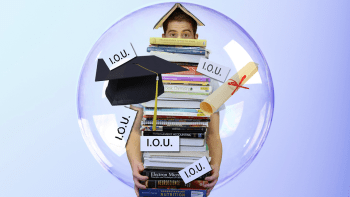 As student loan debt is greater than a trillion dollars and rising rapidly, something must be done or a whole generation is doomed to debt peonage. A college degree is no guarantee of a job, however. Students need to carefully consider their talents, abilities and interests before committing themselves to years of study in an area in which they might be ill suited. Therefore, high school guidance and career counseling is most important. Bernie Sanders was effusive in his praise of Mr. Cuomo’s idea, calling it “a revolutionary idea for higher education” that he envisioned would be emulated elsewhere. “Here’s my prediction,” the senator said. “If New York State does it this year, mark my words, state after state will follow.” Well, the blue states perhaps. But not in the south or the midwest. This proposal might appeal to a lot of Trump voters who have some college education but found the financial hurdles involved in getting a college degree just too insurmountable. College students would still have to pay for room and board as well as fees and books. So it is not a total panacea. Living at home would make getting a college education doable. Undoubtedly, many would move to New York just in order to be able to participate in such a program. Students would have to graduate in either two or four years or else lose their eligibility. They would also have to be qualified academically in order to gain admission to the colleges and universities in the first place. That means they would have to do pretty well in high school or they wouldn’t even be accepted. But not everybody is college material, something that for profit colleges seem to ignore. They take everybody and sign them up for a student loan. 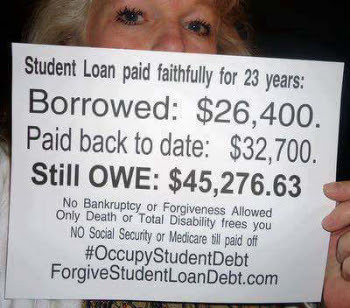 Many do not even graduate, but still are stuck with a lot of debt. If this idea catches on, it could put the for profit private colleges out of business. They are the ones mainly responsible for driving up student loan debt. Good riddance to them, I say. Just this week SAGE college in San Diego abruptly closed shop leaving hundreds of students, some close to graduation, in the lurch. Students said SAGE College withheld information and in some cases continued to collect federal student loan funds and tuition payments as recently as a few days before closing. That’s money students will have to pay back despite the fact they never got their degree or credential. Maginnis said she owes $23,000 in student loans — money she thought was a good investment because court reporters can earn $80,000 a year or more in San Diego. She hopes to get all or part of her loan forgiven. While Trump appoints an Education Secretary devoted to privatizing the public schools, Betsy DeVos, Governor Cuomo of New York is taking the opposite tack by expanding the public school system. We’ll see how this plays out over the next four years as political rivals seek to influence the American people towards either free public education or private charter schools run with public money. It’s a start. Let’s see if they can lift the burden of people who have paid for years and still owe more. Good for New York and California and other states which are doing this. 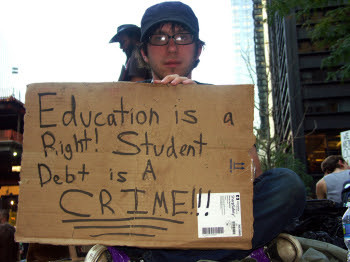 University education has become so unaffordable for so many and student debt is crippling. Having a grand daughter entering college next fall I am fully aware of the terrible costs for students, their parents and grand parents.